You are here: Home>Port of Blyth>Photograph Albums>Album of Photographs and Smith's Prints of Port of Blyth and Blyth Harbour Commission, Blyth, Northumberland.>Photograph of official opening of Terminal, Blyth Harbour, Blyth, Northumberland. Photograph of official opening of Terminal, Blyth Harbour, Blyth, Northumberland. 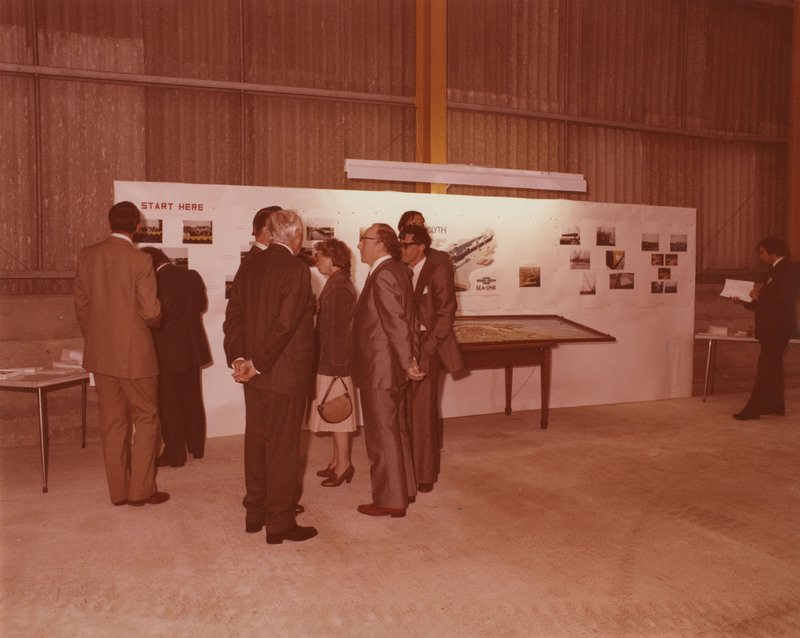 Photograph showing dignitaries in storage facility, STO-RO Terminal, Blyth. File: Album of Photographs and Smith's Prints of Port of Blyth and Blyth Harbour Commission, Blyth, Northumberland. Item: Photograph of Port of Blyth, Blyth, Northumberland. Item: Photograph of Blyth Harbour Commission, Blyth, Northumberland. Item: Photograph of Blyth Harbour, Blyth, Northumberland. Item: Computer generated portrait of Sir Mathew White Ridley, Blyth, Northumberland. Item: Smiths print of Blyth Harbour, Blyth, Northumberland. Item: Smiths print of yacht, Blyth, Northumberland. Item: Photograph of Sir Viscount Ridley ,Blyth, Northumberland. Item: Blyth Harbour Commission, Blyth, Northumberland Centenary Dinner Dance Menu. Item: Photograph of tree planting ceremony, Blyth, Northumberland. Item: Photographs of tree planting, Blyth, Northumberland. Item: Photographs of Blyth Harbour Commission Centenary 1982 Blyth, Northumberland. Item: Photograph of advertisement for Port of Blyth, Northumberland. Item: Photographs of Open Day of Port of Blyth, Northumberland. Item: Copy of Open Day Programme, Blyth Harbour, Blyth, Northumberland. Item: Photograph of official opening of Terminal, Blyth Harbour, Blyth, Northumberland. Item: Photograph of Terminal, Blyth Harbour, Blyth, Northumberland. Item: Photograph of Terminal Wimbourne Quay Blyth Harbour, Blyth, Northumberland. Item: Photograph of STO-RO Terminal, Wimbourne Quay, Blyth Harbour, Blyth, Northumberland. Item: Photograph of part of STO-RO Terminal, Wimbourne Quay, Blyth, Northumberland. Item: Photograph of part of STO-RO Terminal, Blyth, Harbour, Blyth, Northumberland. Item: Photograph of part of STO-RO Terminal, Blyth Harbour, Blyth, Northumberland. Item: Photograph of STO-RO Terminal, in Blyth Harbour, Blyth, Northumberland. Item: Photograph of STO-RO Terminal in Finland. Item: Photographs of STO-RO Terminal in Finland.